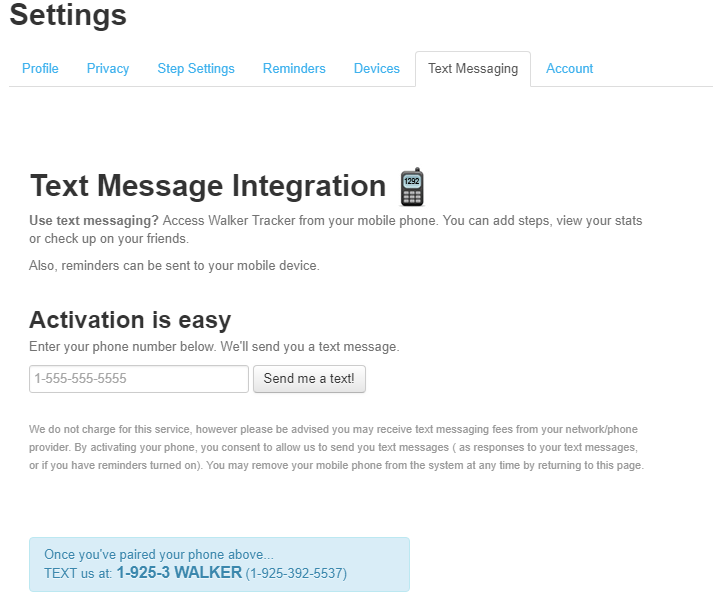 Your phone's built in text messaging functionality can be used to manually post your steps to your Walker Tracker account if you aren't already using a paired device and your program allows for manual entry. To turn on the text messaging feature, login to your account on your program website and then click on your username in the upper right hand corner of the screen to access your profile settings. Click on the Text Messaging tab. Once there, you will enter your mobile phone number and click the Send me a text! button. You can also choose to setup text reminders under the Reminders tab in preferences as well. Once you've paired your phone to Walker Tracker, text can be sent with the below formatting to our special number. eg: 4838 Oct7 I'm currently hiking up the side of a mountain! See date formats. Important note: When sending blog entries, Walker Tracker will append the text to your existing blog entry. You cannot delete text through the text messaging interface. [username] - view a portion of the last post from [username]. stats [username] - view stats for [username]. 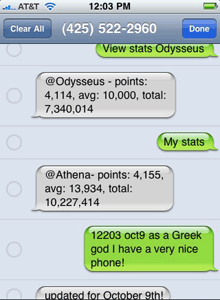 @ Athena compares her stats to @ Odysseus and then posts an update for October 9th. 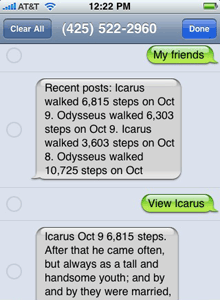 @ Athena sees how her friends are doing, and then checks up on @ Icarus's latest post. If you don't live in the U.S. or Canada* - text messaging may still work. Please check with your mobile network carrier to see if the U.S. is included in your text messaging bundle or if the rates are acceptable to you. * most Canadian network carriers send to the U.S. at the same rate as in-country. However, please double-check with your carrier.